The ensemble inEcho are recording music from the 16th 17th and 21st centuries in Romsey Abbey, with our St Teilo organ. It is a programme called Northern Soul with music tracing the cultural interaction across northern Europe. From left to right in the picture are Silas Wollston on harpsichord (and organ), Richard Boothby viol, Anais Chen viola, Emily White sackbut, Bojan Cicic violin with Gawain Glenton on cornet to the right (and a photographer whose name I don’t know in front). Their music-making is really wonderful and we are privileged to have our Welsh Tudor organ involved. 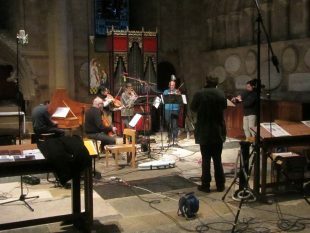 If you are interested in contributing to the costs of the recording see the website http://www.crowdfunder.co.uk/inechocdappeal for Gawain Glenton’s appeal or their own website http://www.inecho.co.uk/were-crowdfunding-now.html.